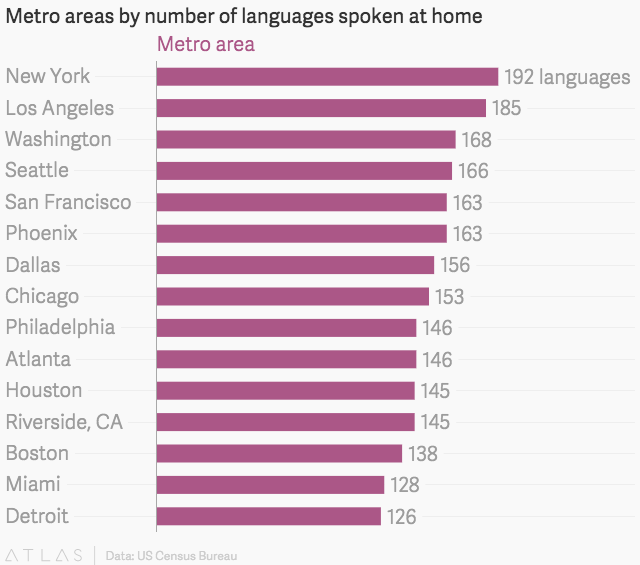 All 300-plus languages spoken in American homes, and the number of people who speak them. Every year, the U.S. Census Bureau releases data on the languages spoken in American homes. Usually it groups the languages in 39 major categories. Now it has released much more detailed figures, which show that Americans speak not 39, but more than 320 distinct languages. The bureau collected the data from 2009 to 2013 as part of the American Community Survey, which asks Americans all kinds of questions to create highly granular estimates on various demographic indicators. The new data estimate that more than 60 million Americans speak a language other than English at home. Included are 150 Native American languages, as well as relatively obscure ones like Pennsylvania Dutch, Icelandic, Mongolian, and many others. The data estimate that Sudanese, for example, is spoken at home by only 35 Americans. Patwin, spoken by a group of Americans native to northern California, it estimates at just four speakers. The data also show which cities have the most linguistic diversity. New York is home to 192 distinct languages; Los Angeles, 185. The full list of the hundreds of languages spoken in American homes is included below—minus 32 languages for which the bureau withheld the raw number of speakers, likely out of concern that the number would be small enough to let anyone de-anonymize the data. Spanish, spoken at home by more than 37 million Americans, is far and away the largest non-English language used in the US. It’s followed by “Chinese,” which probably mostly refers to Mandarin (even though that has its own category, confusingly enough). The four Patwin speakers thank you for making it all the way to the end of this list.